* I would have preferred to use fresh shrimp, but none of my local markets had raw, large shrimp, so I went with a bag of frozen, pre-cleaned, easy peel – thawed, peeled, and blotted dry. ** While rice flour tends to produce the best “crisp,” you can use AP flour, or even cornstarch. *** If you “like it hot,” but your curry blend is on the mild side, pump it up with a pinch of cayenne. **** A nice Mango Chutney would be great with these as well, but I opted to use some of my homemade plain yogurt mixed with additional curry powder. Peel your pineapple by slicing off the top and bottom, then carefully making lengthwise slices all the way around the outside, going back with the knife to shave any remaining rind. Set up your dredging station by setting out one bowl containing your flour (again, feel free to add a pinch of cayenne if your curry blend is mild) curry, S&P whisked together, a second bowl containing your beaten egg white, and a third containing your ground granola. Heat your oil – I prefer to work in smaller batches/smaller pot and about 1″ of oil. Blot your cleaned/peeled shrimp dry and, holding each by the tail, dip first into the flour mixture (shaking off any excess), then the egg white, then the granola (shaking off any excess) – repeat and set aside. When all of your shrimp have been double-dipped, fry them a few at a time for about 3″ until golden. 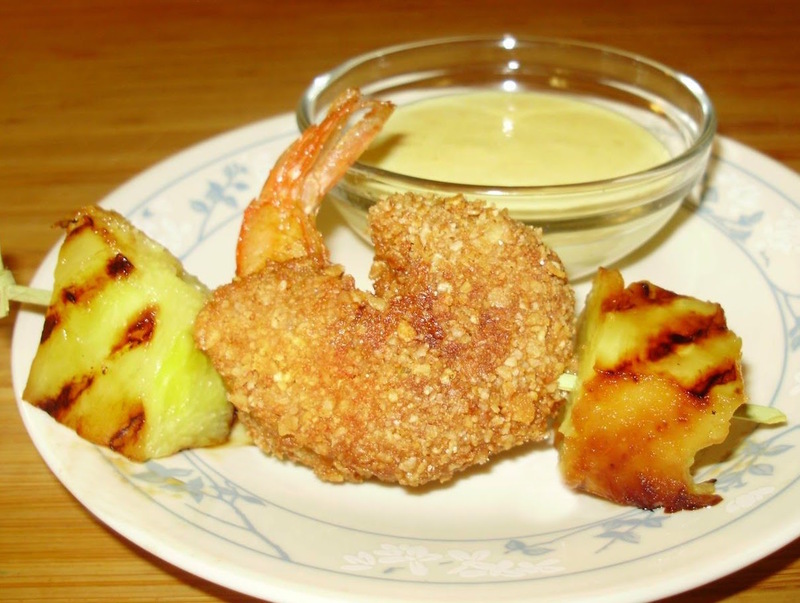 Skewer a pineapple chunk, followed by a shrimp, then another pineapple chunk, and serve with your preferred dipper.